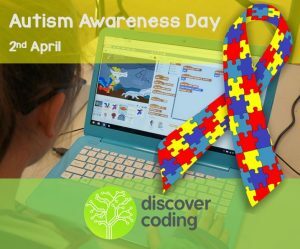 Did you know that those in the autism spectrum, computer programming can be a great strength? Dr. Temple Grandin, Ph.D., who speaks around the world on autism and is one of the most accomplished adults with autism spectrum disorder, says computer programming is a natural talent area for autistic children. It should be taught so it develops into a skill that may be used for future employment. Many of the traits of a software engineer, include strong attention to detail, recognizing patterns, and determination to problem solve, are natural for those on the autism spectrum. These skills can be fostered and nurtured into a thriving career in software engineering, quality assurance or web development. We are very excited to partner with Children’s Autism of Edmonton and Dynamyx to create a pilot summer camp to combine the benefits of learning to code and physical movement to young kids. Kids will first explore gymnastics apparatus and games with Dynamyx Gymnastics. Experienced teachers with Education and Computer Science background from Discover Coding will guide students through the fundamentals of computers, computing science, game design and coding. Students learn in front of a computer, as well as through unplugged activities. The experience is about problem solving through fun and discovery. Students will learn coding concepts including algorithms, loops, conditionals, and events. Students will program multiple types of games and projects, and will choose the features they want to build, and advance their problem-solving skills. They will take ownership of their own projects and collaborate with their peers to create awesome products. By the end of the session, students will use a visual programming language to create a game they can share with their family and friends! Children’s Autism of Edmonton staff will be providing extra support to ensure a positive and fun learning experience for all.